Charleston is one of the oldest cities in the United States so it makes sense that many of the locations within the city would be haunted. During my stay in Charleston I stayed at a haunted bed and breakfast called the Battery Carriage House Inn. 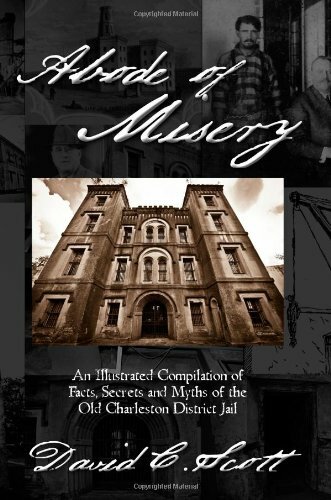 While, I only experienced minor hauntings at the inn; my wife and I had several chilling encounters at the Charleston jail. The Old Charleston Jail served as a dumping ground for the worst criminals in the city of Charleston. The Jail opened in 1802 and operated until 1939. There were several reconstruction projects at the jail aimed at revitalizing the site. When it was originally built it was four stories tall with a small tower on top of the building. These features still exist. However, in 1886 an earthquake did do considerable damage to the building and repairs were necessary. During the years that the jail remained open it was home to some of the worst criminals in the Deep South. Some of the last pirates of the 19th century were jailed there and eventually hung. Notably, Charleston was actually blockaded by pirates during the early 19th century and some of the same people that orchastrated the blockade were ultimately hung in the jail. Later in the late 19th and early 20th century one of the first serial killers in the United States was executed and incarcerated in the jail. Lavinia Fisher is widely considered to be the first female serial killer in the United States. Lavinia and her husband would rob and murder men from the city. Lavinia would lure them back to her house and then poison them. After they were dead she and her husband would steal their money. It is possible that she was responsible for the deaths of over a hundred men in the area. Eventually she was caught and put to death at the Old Charleston Jail. Lavinia would become the focus point of a Ghost Adventurers investigation. The Old Charleston Jail became a focus point during the Ghost Adventures episode 10, season 5. In the investigation numerous references were made to Lavinia Fisher and her involvement in the deaths of dozens if not hundreds of men in Charleston. During the investigation, the crew managed to get an EVP. The EVP made reference to Lavinia's last words before she died. The crew also were followed or stalked by an orb during their investigation of the Old Charleston Jail. This is similar to my own experience at the Old Charleston Jail. In the picture above (I took) on my investigation of the Old Charleston Jail you can see several orbs in the top right corner. Most orbs appear in the frame or photo but in other photos of the same location they are gone. Paranormal investigators claim that these orbs are the spirits or residue of humans that continue to remain on the physical plane of existance. First, before I begin, I have to recommend that you take a tour of the Old Charleston Jail yourself. Check out Bull Dog Tours in Charleston South Carolina. They offer excellent Ghost Tours of haunted locations including: Old City Jail. The Old Charleston Jail is a forbidding sight. You can see in the pictures that I have linked that from the outside it looks as if you are walking into a haunted building. Everything from the gothic architecture to the forbidding bars on the windows gives me the creeps. I was scared from the moment that I walked into the building with my wife. We used a camera and video recorder. If possible bring an EVP. The tour guides will pause and let you do some independent investigation on your own. If you have an EVP you can ask the spirits questions. I would recommend that you also take a high powered camera on your visit to the Old Charleston jail. Here is another picture we took. In this photo you should be able to clearly see the orb that we captured. We captured dozens of photos like this, but this is a really good example of how clear the orb was in the photo when we took it. Unfortunately during our visit we only captured evidence of orbs. There were no apparitions, but the orbs were very clear. Also we didn't see any electoplasm which is commonly thought to occur around apparitions. My wife claims that the spirits actually touched her on several occasions and I am inclined to believe here. The building was stuffy, hot, and there was a palpable trace of a malevolence there. There were no physical marks on her body after the investigation, but she claimed something did rub her and pull her hair on a few occasions. Other female's in the group complained of the same phenomena. It makes sense that since the prison housed mostly males that they would be reaching out to living females who are visiting the prison. One of the rooms we visited was called the stretching room. The stretching room was a room where they tied you up and stretched your body out. This was the room where we caught several orbs on film. The room pictured above was an adjacent room where they kept iron cages to house prisoners. If I am not mistaken this was the room that Fisher was left in. I recommend that you take a trip to the Old Charleston Jail. It is a haunting experience. The site has now been turned into a art studio which is ironic, but most of the building is avaliable for tours. There are numerous rooms that you will tour through that have a dark past to them. In these locations you can feel the evil seeping through you. It is worth it, but be careful something might grab out and contact you! Charleston is one of my favorite cities in the US. The jail is very cool. The "ghost" hunting/hunters are a huge waste of protoplasm and time. Good article, though. A thumb.